Dutch painter and draughtsman. At the age of 16 he was apprenticed to his uncle Master Hans , an animal painter, with whom he studied for six to seven years. He spent his entire career in Amsterdam. At first he painted landscapes with cattle in the style of Pieter van Laer, but his best works are either domestic interiors or history paintings with figures, or full-length group portraits set in a landscape or interior. These small paintings (e.g. Family in a Landscape, Amsterdam, Rijksmuseum) required considerable technical dexterity. Despite the fact that Graat s work is of an excellent standard, he received little recognition. Consequently, his paintings have been sold under the name of better-known artists such as Gerard Terborch, with whose work his own has much in common. 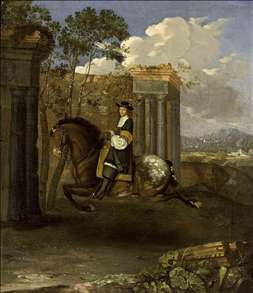 See more details about "Equestrian Portrait of a Gentleman"